It’s hard to pick our favourite product from this GMO-, soy-, and nano-free, cruelty-free brand founded by Rose-Marie Swift. There’s their beautiful luminiser, lipstick and multi-purpose lip shine, but if we really had to pick, it’s their concealer, which is also a favourite of Lily Aldridge. Lightweight and hydrating while covering up imperfections, the creamy concealer actually works and comes in recycled glass and lid. Available in 16 “un” cover-up shades, it melts into the skin and feels like a second-skin. The Singapore brand is the World’s first ‘serious’ water-based organic skincare label, and is certified organic, vegan, non-GMO. It uses natural ingredients too. The brand believes that cleansing is the first and most important step in skincare, so you should try their Japanese Knotweed Coconut Hydra Cleanser. Japanese Knotweed, rich in resveratrol (even more potent than grape skin), is highly concentrated in antioxidants to fight free radicals and prevent sagging of skin. Coconut oil hydrates skin while cleaning pores thoroughly, so you have a healthy and glowing complexion. 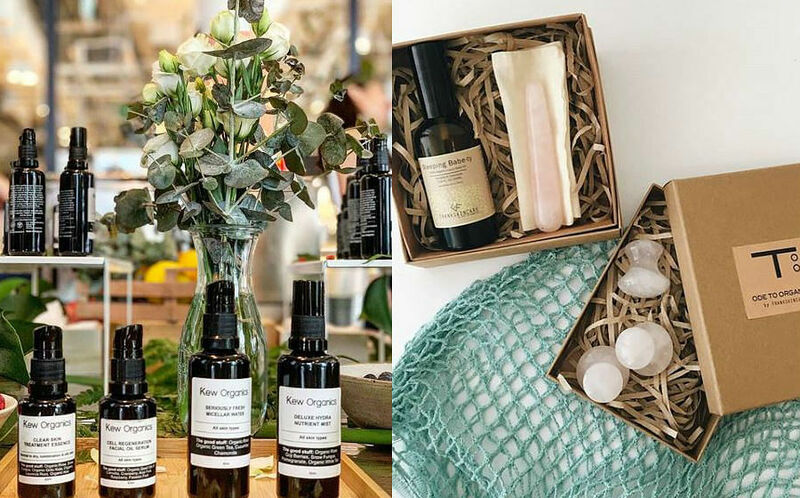 Produced, formulated and packaged in Singapore, the star product from this local beauty brand is their 100 per cent organic face oil. The one to take note of is the Radiant Preg Luxury Face Oil which is safe enough for pregnant women to use, and also suitable for mature skin. The multiple vitamins, antioxidants and fatty acids help with regeneration of skin cells while solving problems such as excess sebum, skin sensitivity and acne. Unlike mass-produced skincare which contains synthetic chemicals to extend the product shelf life, Frank Skincare creates small batches each time so you know what you’re getting is as fresh as it gets. Cruelty-free and made in the USA, this line of vegan cosmetics, skincare, soaps and shampoos ensures you can have a completely clean beauty routine. The colours in 100% PURE® cosmetics are from vibrant fruit, vegetable, and pigments which contain vitamins, antioxidants and other healthy phyto nutrients that make skin healthier. Their fruit-pigmented mascara, using tea, cocoa and coffee, coats eyelashes with maracuja oil and naturally occurring vitamins and essential oils that nourish and strengthen lashes. Vegan, gluten-free and ethically sourced, Au Naturale was founded in 2011 by a nuclear analyst looking for cosmetics that would be safe and non-irritating for skin. We love the bold lip colours from their Eternity lipstick range that have high pigmentation, creamy texture and glide on easily with the nourishing oils from castor, jojoba, camellia and sunflower. All to keep lips plump and hydrated. Made with renewable energy, Vapour products are known for their multi-use purposes, so they cut down your consumption of beauty products and ensure you get more bang for your buck. All natural and organic, these cruelty-free products are packaged in recycled aluminium and glass. Be sure to try out Aura, a convenient stick that adds a beautifully blendable pop of colour to lips, cheeks and lids, and is infused with Vapour’s Herbal Enlightenment Complex of Frankincense, Tulsi and Lotus to help soothe and calm. Stick application allows products to be quickly blended with fingertips, so you don’t need a brush or sponge. Afterglow Cosmetics’ unique blend of minerals and natural pigments that are free of irritants such as bismuth oxychloride has been very carefully formulated to cater to the most sensitive skin. Mineral makeup is often recommended by dermatologists post laser procedure because it is so gentle. Cruelty-free, soy-free and fair trade, Afterglow Cosmetics has eco-friendly refills that you can mix and match in your customisable eyeshadow palette. When you have finished one eye shadow shade, simply remove the pan with your finger and replace it with a fresh pan! You avoid harmful chemicals in your food and skin care products, but you’ve probably forgotten about your nails. These days, less toxic nail polish is no longer limited to basic colours. Base Coat offers 105 custom colours that are plant-based and free of the most toxic chemical ingredients including petrochemicals, parabens, sulfates, camphor and formaldehyde. Leaping Bunny certified (the gold-standard in cruelty-free certification), vegan, and gluten-free, the brand is still working to develop a chemical-free formulation, but this is as clean as it gets for now.